NU guard Vasa Pusica got fouled by Kansas’ Quentin Grimes on this play, but scored only 7 points in the Huskies’ loss. 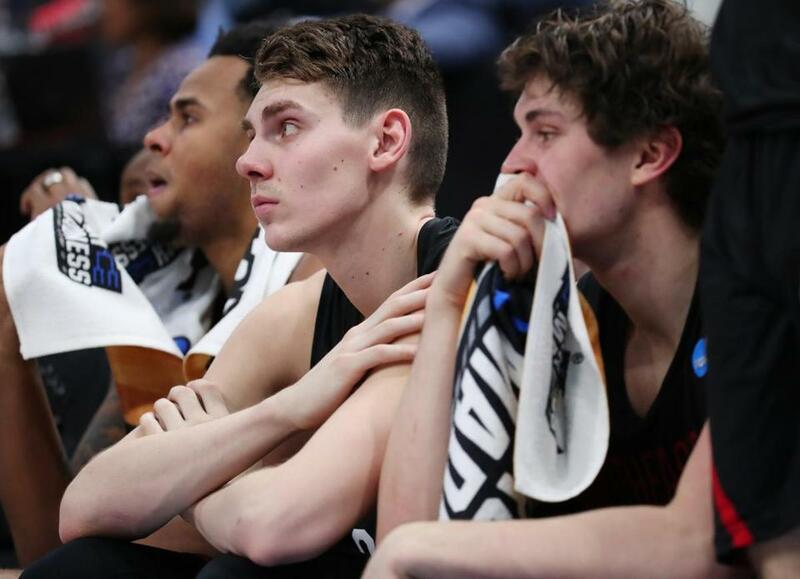 SALT LAKE CITY — Northeastern’s season ended with a thud, buried by poor shooting. It didn’t follow the blueprint that the No. 13-sseded Huskies knew they needed to spring an upset over fourth-seeded Kansas in the first round of the NCAA Tournament. Northeastern needed to come out on the fire from the perimeter and keep the Jayhawks from taking control in the paint. Neither of those things happened in an 87-53 loss to Kansas on Thursday afternoon at Vivint Smart Home Arena. The Huskies have lost seven straight NCAA Tournament games since a 90-87 victory over Long Island in 1984. Northeastern shot just 28 percent (16 of 57) from the field and could not get on track offensively over the final 30 minutes in getting bounced from the Midwest Regional. The Jayhawks experienced no such problems. They cruised to a victory after outrebounding the Huskies, 45-27, and outscoring them in the paint, 50-16. Northeastern players react as Kansas pulls away in the second half. Things fell apart for the Huskies shortly after halftime. Northeastern cut a 12-point halftime deficit to 37-30 on a jumper from Jordan Roland and an alley-oop dunk from Anthony Green. Kansas called timeout after going scoreless in the first three minutes of the second half. 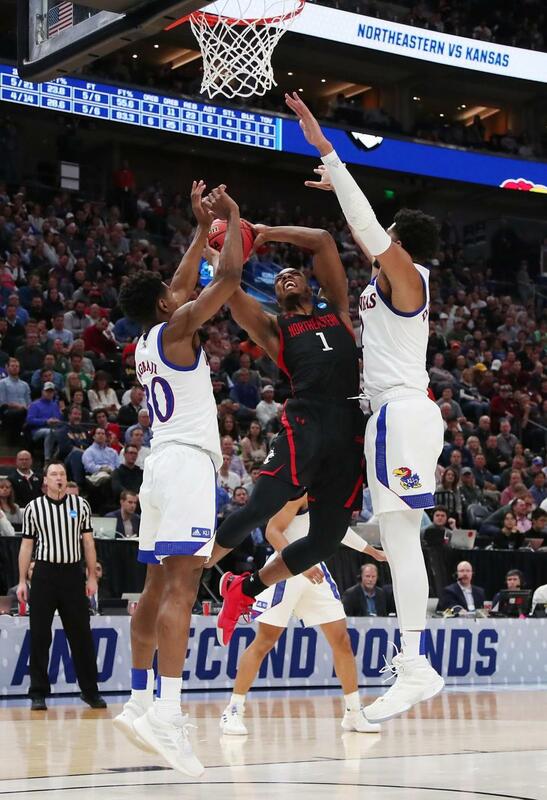 When play resumed, Kansas extinguished any comeback hopes for Northeastern by ripping off a 32-6 run to take a 69-36 lead with 6:29 remaining. Quentin Grimes, Dedric Lawson, and Devon Dotson scored baskets on four straight possessions to ignite the lengthy spurt that buried the Huskies for good. Roland led the Huskies with 12 points on 5-of-13 shooting and ended up being the only Northeastern player to score in double figures. Leading scorer Vasa Pusica totaled just 7 points on 2-of-13 shooting. Dedric Lawson spearheaded a potent offensive attack for the Jayhawks, finishing with 25 points and 11 rebounds. Dotson chipped in 18 points while K.J. Lawson and Ochai Agbaji added 13 apiece. Kansas will face fifth-seeded Auburn in the second round on Saturday. 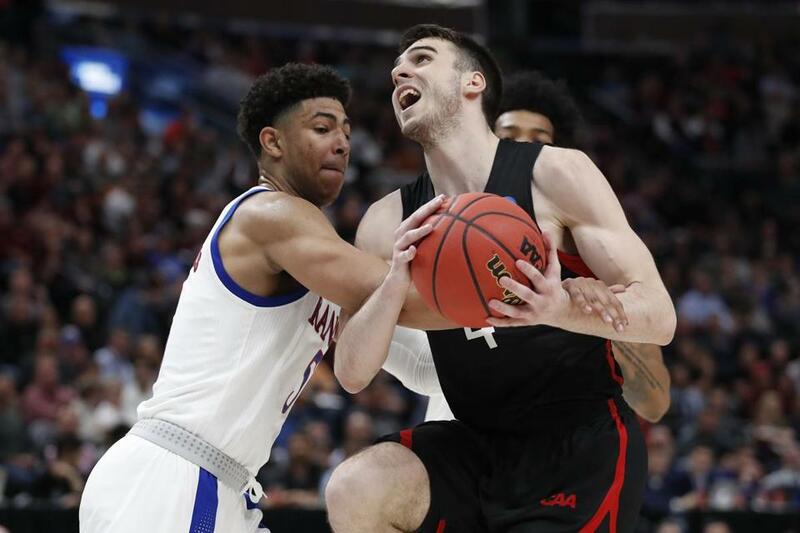 The Jayhawks won their 13th straight NCAA Tournament first-round game by asserting themselves on offense and locking down on defense. They were able to limit Northeastern to one shot on most possessions and repeatedly used their size and length in attacking the rim on the other end. Kansas sprang to life after Northeastern closed to 20-19 on a 3-pointer from Pusica. The Jayhawks held the Huskies scoreless over a four-minute stretch and ripped off an 11-0 run to build a 31-19 lead with 4:06 remaining in the half, with Dedric Lawson and K.J. Lawson each scoring a pair of baskets to fuel the run. The Huskies scored just two baskets over the final 10 minutes of the first half. Pusica and Bolden Brace each made a 3-pointer, but Northeastern missed 14 of its final 16 shots before halftime. Overall, the Huskies shot 8 of 31 from the field over the first 20 minutes. Even before halftime, Kansas had begun to impose its will around the basket and use size and length to its advantage on both ends of the court. The Jayhawks outscored Northeastern, 26-4, in the paint in the first half alone and had 11 fast-break points. 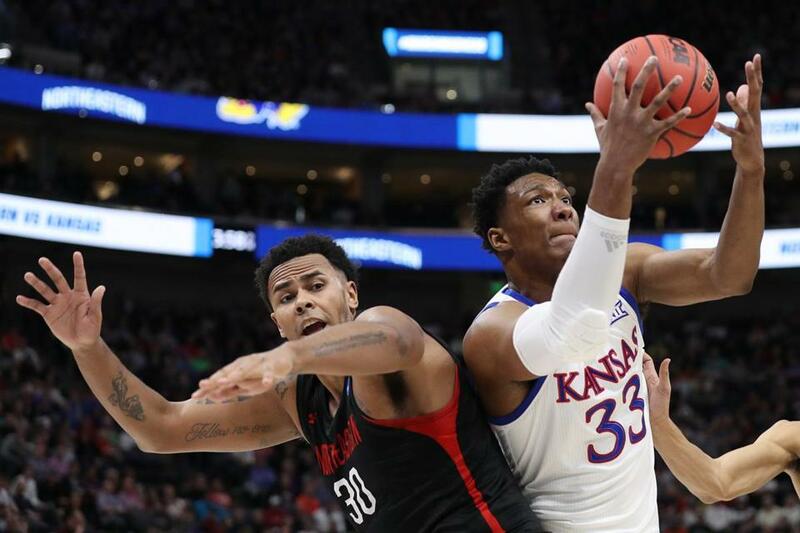 Kansas forward David McCormack bumps past Northeastern’s Anthony Green on a second-half drive. Seeing few shots had a tangible effect on Northeastern. The Huskies started taking more 3-pointers off the dribble. They started to deviate from their usual mode of attack on offense and the hole just grew deeper and deeper. “We kind of relied on our offense and our 3-point shooting and when that didn’t work out, other parts of our game fell apart,” Brace said. Northeastern’s Shawn Occeus could find little room against the Kansas defense. Northeastern fell to 1-22 all-time against teams ranked in the AP Top 25 Poll. Kansas was ranked 17th in the final poll of the season.